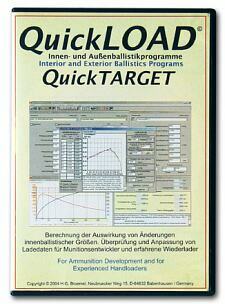 This is realy one of the best tools for reloaders and anyone who is loading more calibers will easily recoop the cost. +1 to Mr. T’s thoughts. It will save you time, money, headaches, and will really help you understand optimal barrel time, accuracy nodes for barrel lengths among other things! This is great software and it predicts loads very accurately. I wish there was a Mac or iPhone version. I’ve been using this software and buying the updates/upgrades since 2005. For me it’s an indispensable reloading tool. However, the update delivery method is antiquated and insanely expensive. eg the CD costs a very reasonable $15.95 but postage to Australia is an extra $55.08. When Neconos gets with the times and introduces on-line data transfer, I’ll buy the latest update. 100% Agree. Buying a CD and shipping it for an update? Are you freaking kidding!? Its the only thing stopping me as well. Awesome tool, but please make this a web service and charge users an annual subscription. Delivery of Win32 applications via CD or download is truly antiquated. Come to think my first software was Load From a Disk by Wayne Blackwell. And it was very good stuff 20 years ago. Be advised, call before buying to see if the update has what you want on it. Editor: We disagree. If you haven’t updated in more than two years, you should definitely get the update. There is some new powder info supplied by the manufacturers even for propellants already listed. That’s worth the price of the update by itself. “Load From a Disk”, yep still have it. QL consigned it to the bottom draw. Editor, I’m sure the few of us posting here are not alone in wanting on-line updates. Is it worth a forum poll to determine the level of support for this to help motivate Neconos to modernize delivery? Can anyone confirm if the new version has the new #2231 200 grain .308 Sierra Matchking and Berger .308 200 grain 200.20X bullets? I’d buy it only if it has data for Alliant 2000-MR. I bought the last update and was disappointed that wasn’t in there. Editor: Is that the only powder you use? 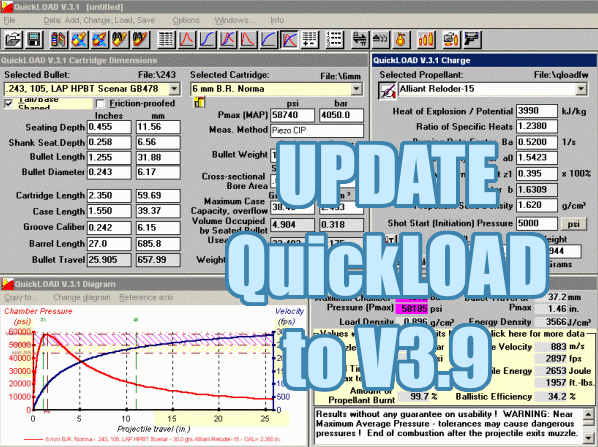 That is a versatile powder, but one of the great benefits of QuikLOAD is that it lets you analyze and compare loads “on paper” with a number of different powders. You might find one that works better, with lower ES/SD. What is the latest quick load up date. I believe I need an update. Any hints on new powders listed? Looking for powder updates. My last update dated 12/2016. Specifically IMR 8133, VV N565, & Ramshot LRT. Any word on a powdwr update? Looking fpr data on Alliant 2000MR. My last update disk is dated Mai 2017. Has there been a more recent powder and bullet update? Looking to see if the latest update has alliant power pro 2000MR.